Pro-abortion forces aren&apos;t stupid, they&apos;re calculating. I&apos;ve already discussed the DeLauro-Ryan bill, and why I think it needs to be urgently defeated. It is attempting to split the pro-life movement by claiming that those who do not support contraception are not truly pro-life. The sponsor of that bill, Democrat Tim Ryan, was quoted earlier this week by Steven Waldman, the guy behind religioninternet portal Belief.net. Steven Waldman introduces Tim Ryan as a "pro-life Democrat and author of the Ryan-DeLauro bill, which attempts to reduce the number of abortions in part through expanded use of contraception." 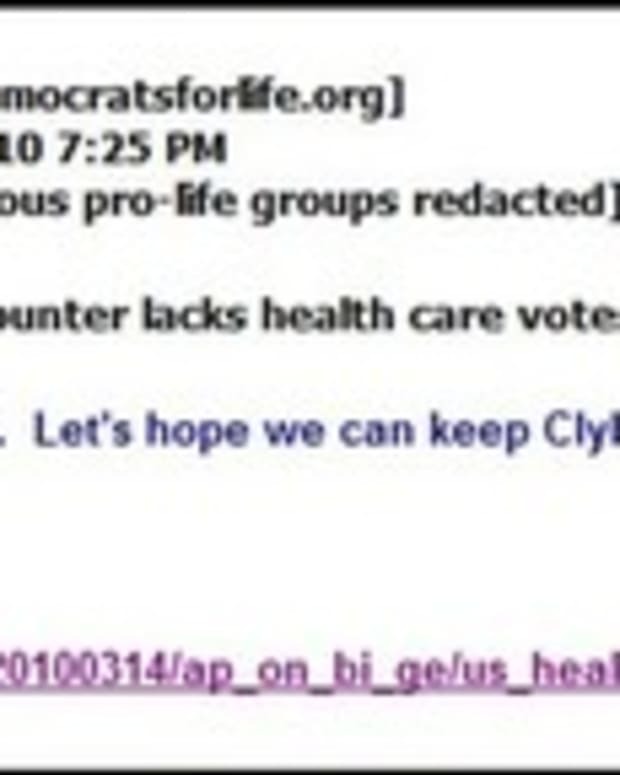 Reality check: Tim Ryan, as others have explained (see link to the DeLauro-Ryan bill above), isn&apos;t pro-life. Or rather, his "pro-life" solutions will actually increase the number of abortions. I typically try to make arguments about abortion through reasoned argument. I rarely, if some have noticed, pull out the Papist bat. But here I need to: just how does Waldman, who runs a religion website, think he can promote contraception without alienating faithful Catholics, and make no mention that he&apos;s going against the teaching of the Church? Would he, say, talk about advocating blood transfusions for jehovah&apos;s witnesses without tripping over himself to mention that the leadership of that denomination opposes it? Nope, because even the religion editor knows that Catholic teaching is the one that he can get away with ignoring, with no argument. "The new fault line is not between pro-life and pro-choice people. It&apos;s within the pro-life community. The question now is: &apos;are you pro-life and pro-contraception, therefore trying to reduce the need for abortions, or are you pro-life and against contraception and you hope that people&apos;s lives improve just by hoping it, wishing it so.&apos;"
Despite claiming to be pro-life, Ryan just insulted the pro-life movement in a reprehensible fashion. He creates a straw man argument for the pro-life, anti-contraception movement. Does he honestly believe pro-life, anti-contraception individuals (let&apos;s be honest, the majority of them are Catholics) simply "hope and wish" that abortion will go away?! Reality check: there are hundreds of pro-life pregnancy centers which do not distribute contraception, but provide concrete care to pregnant women. There are thousands of pro-life individuals who work at these institutions. There is a massive network of Catholic hospitals in the Unites States that provide care to pregnant women, and they don&apos;t distribute contraception. There are tens (if not hundreds) of thousands of Catholics (and other Christians) in America that support these efforts through the contributions of their money, time and prayers. So how dare Rep. Ryan claim that those who do not distribute contraception are not doing something to actively reduce abortion and promote a culture of life in America where every human being - mother and unborn child - are cared for and valued? And I haven&apos;t even touched the fact that throwing contraception at women at-risk of becoming pregnant isn&apos;t going to ultimately address the problem of abortion in this country. But let&apos;s start with some common ground: those who don&apos;t distribute contraception are certainly doing more to improve the lives of pregnant woman and children than just "wishing" and "hoping."